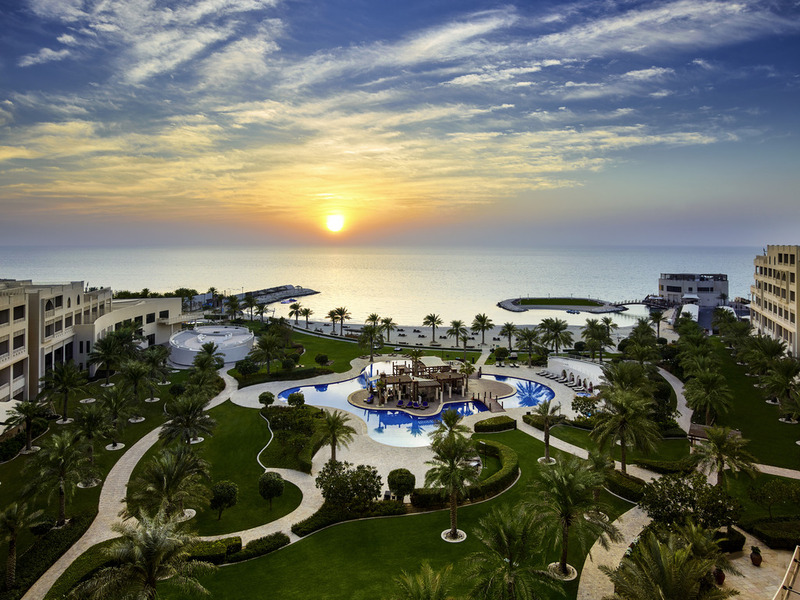 Experience the healing benefits of seawater at the Sofitel Bahrain Zallaq Thalassa sea & spa resort. Indulge in massages, wraps, and a variety of seawater treatments to restore vitality and relax body and mind. The spectacular beach-front setting and five-star amenities make for a memorable getaway, whether for a weekend or a complete 6-day spa package. Exciting dining options and nightlife are on the menu, from award-winning seafood and Arabian specialties to belly dancing and live music. Sofitel's Bahrain hotel has 262 elegantly appointed rooms and suites, each with private balcony, latest technology and chic furnishings. The 21 Prestige, 6 Opera and one Royal suites offer a terrace with pool and fantastic views of the Arabian Gulf. La Mer offers freshest catch of the day, where guests enjoy live cooking with a French savoir faire. Fresh ingredients, homemade pasta and an antipasti bar await diners at Fiamma, a trendy Italian restaurant in Bahrain. Smell the aroma of pizza hot from the wood-fired oven while dining inside or on the terrace overlooking the pool and sea. A dedicated lounge and bar area where you can sample true Lebanese and Persian cuisines in a subtle blend of traditional and modern décor. Live music, singers and belly dancers provide a festive atmosphere. On the first floor with separate entrance. Casual, all-day dining area overlooking the pool and sea, serving exquisite, flavorful buffets from across the world. Choose from breakfast, lunch or dinner, plus the à la carte, live cooking station. Perfect venue to enjoy a family Friday brunch. Unwind in Amber bar, just off the lobby, amid luxurious couches and a spectacular amber bar. With its cocktails, soft drinks and cozy ambiance, this Bahrain cocktail bar is ideal for an informal business meeting or pre-dinner apéritif. Find an oasis in the water at Lagoon Pool Bar, a swim-up bar in the center of the freeform swimming pool. Emerge from the waters for a refreshing drink, sip a cocktail at sunset or catch a quick bite to eat between thalassotherapy treatments or meetings. The Lobby Lounge's elegant décor blends Bahraini style with elegant French touches and views of the atrium and sea. Linger over coffees, teas, fresh pastries and à la carte dishes, ideal for a business meeting or intimate rendezvous. Tapas Restaurant & Bar brings the sea inside with its brilliant shades of blue. Enjoy scrumptious tapas and cocktails in the trendy interiors, or outside on the terrace by the sea. Get a taste of Bahraini nightlife with live music, DJs and shisha. Experience the healing power of seawater from the Arabian Gulf in Thalassa Sea and Spa in Bahrain, a unique thalasso therapy institute and luxury Bahrain spa resort. Massages and treatments from oxygen bubbles to seaweed wraps use Aquascience products.